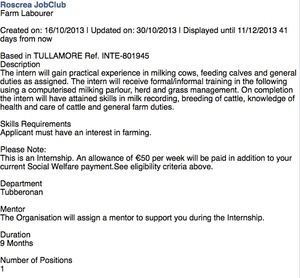 Posted in Misc and tagged JobBridge at 5:34 pm on August 13, 2014 by Broadsheet. I think it’s a painter and decorator based in Knocklyon going by the email address. Could be wrong though. You’re sweet Rumple. But you’ve disappointed me terribly. In my experience, Painting and Decorating is weighted heavily towards, em, painting. To be fair, it was my own fault. I replied to an Ad. for such a creature and naively gave the chap Carte Blanche with my Upper east Side loft, the results were heavily redolent of pre-war Sundrive Road. Some tassled lamp shades, a part worn Aiwa ‘sound centre’ and some prints by a Mr. ‘Rasher’ greeted me with ill deserved confidence upon my return. Painter AND decorator indeed…..